It is rare and precious to find a genuine Dharma craft artisan trained in the old traditions. 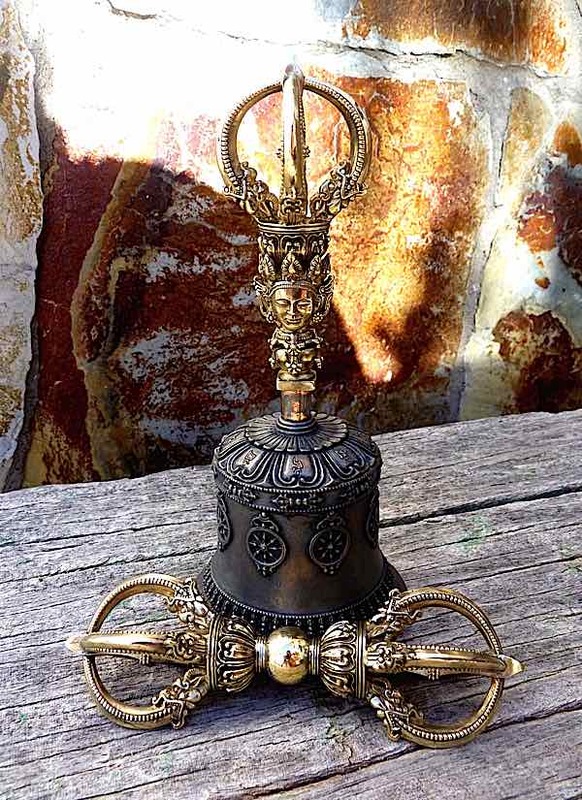 Today, most Dharma ritual objects are bronze knockoffs made in factories. 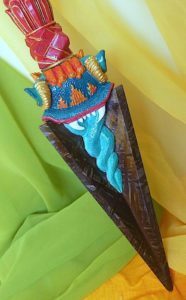 It is exceedingly rare to find traditional hand-crafted ritual objects —made by a qualified and trained Dharma-practitioner craftsman, in the old way. 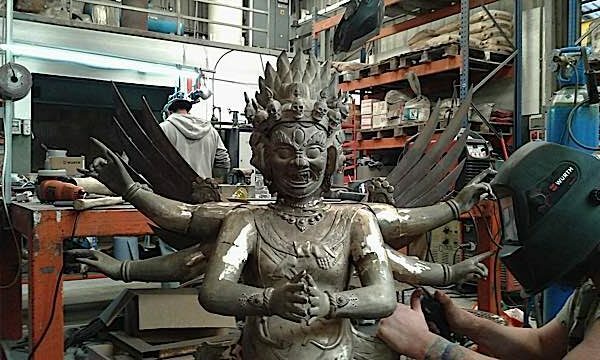 For this reason, we were thrilled that Rigdzen Pema Thuthob (Platon Viaznikovtsev) — who creates not only magnificent traditional Dharma ritual art, but also works, uniquely, with meteoric iron — agreed to an interview with Buddha Weekly. A very special all-meteoric wrathful iron vajra (dorje) created at Natsog Dorje. 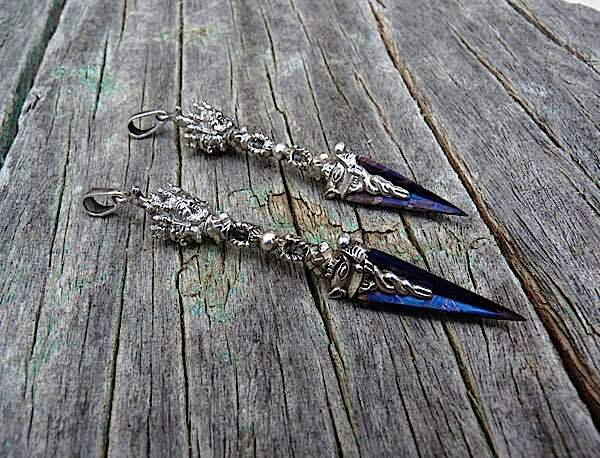 Hand-crafted Phurbas created with meteoric iron blades. 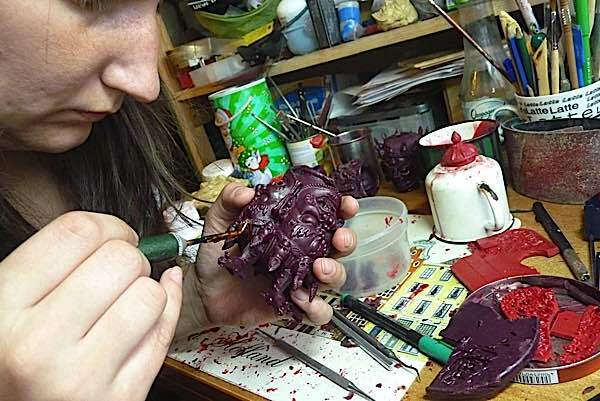 Tashi Lhamo makes a hand carved wax model of the Phurba’s head in the traditional way. Traditionally, mantras are chanted as work commences and rituals are performed. All craft work must be by initiated Tantra practitioners. Natsog Dorje workshop is now a team of three, with a long waiting list of custom art on order. Many well-known teachers have come to Natsog Dorje for ritual objects: Ganteng Tulku Rinpoche, Garchen Rinpoche, Rigdzin Namkha Gyatso Rinpoche, Tsewang Dongyal Rinpoche, Phagchok Rinpoche, Sogyal Rinpoche, Gochen Tulku Sang-Ngag Rinpoche, Orgyen Thobgyal Rinpoche, Jigme Tromge Rinpoche, and Chagdud Khandro. 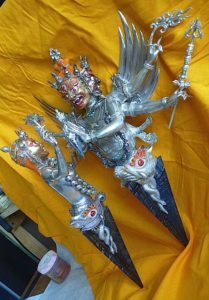 A magnificent hand-crafted Hayagriva Phurba with wrathful meteoric iron blade and painted deities. From terma Yidam Gongdu. As for my skills in working with metal, I worked for many years in various restoration workshops in Saint-Petersburg. 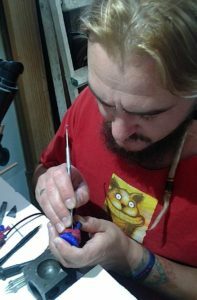 And when you are engaged in the restoration of old masterpieces, you are forced to master the skills of various techniques of work from forging, to jewelry craft. 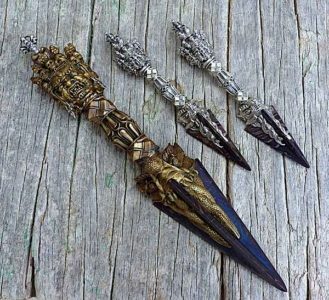 Spectacular Phurba jewelry with meteoric iron blade and silver handle. As for aspects of Vajrayana art, it was a really long journey, and I think that I am still at the very beginning of this journey. 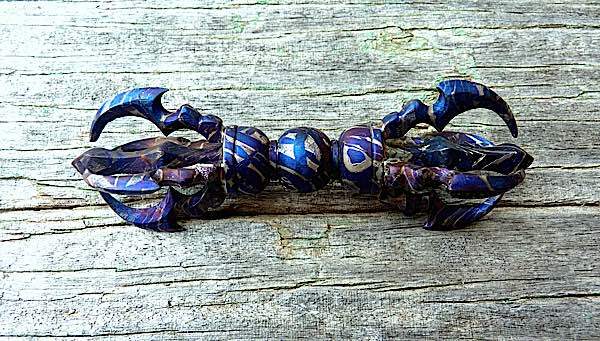 My first vajra and digug (curved knife, widely known attribute of Dakini) I made in 2005. Before I began, I received teaching and initiation. These first objects were not very good. At the time, I did not have any practice experience and knowledge regarding the Dharma. And since then I have carefully developed with more and more study and practice. Recently finished hand-crafted dorje and bell project. I constantly turned to my gurus, with questions and requests for instructions — which they gave me with unfailing kindness. Now, I no longer work alone. 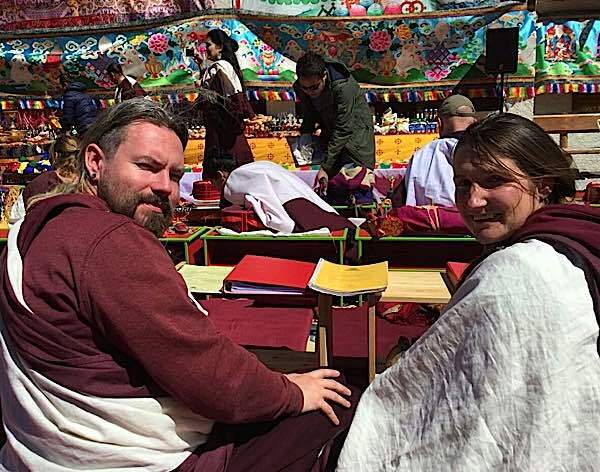 The workshop of Natsog Dorje currently consists of three people. I head it (Rigdzin Pema Tutob), my wife Bogdana (Tashi Lhamo) and my friend Cyril (Namka Dorje) work with me. BW: What got you started in this craft? What motivates you? Rigdzin Pema Tuthob at work. Meticulous craftsmanship in the traditional way is time-consuming. My root guru says that this was a good karma from past lives. But, I can tell you how I first become motivated. 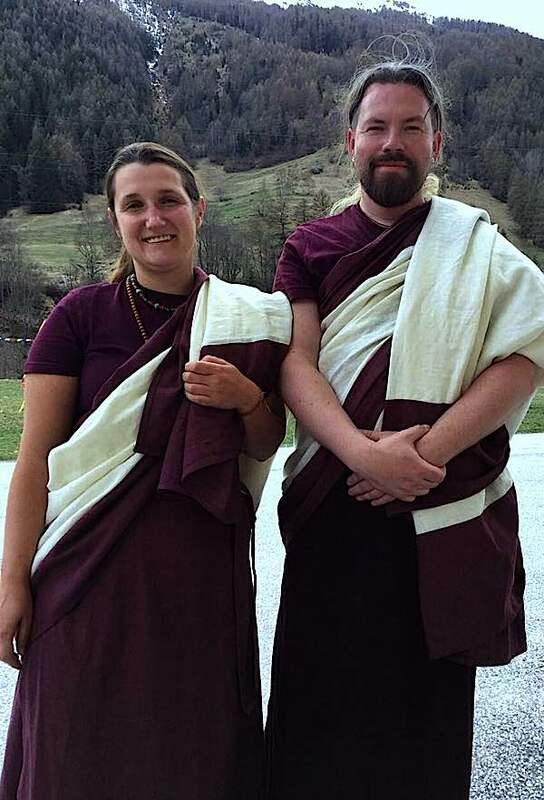 When I just started practicing, I realized it was almost impossible for a practitioner to get ritual objects in line with the traditions and requirements for Vajrayana practice. In general, if you look to antiques — old or even ancient ritual objects — many correct and beautiful. But modern ones do not measure up to traditional techniques. Therefore, my main motivation was always the intention to revive almost lost traditions. I wanted to preserve the original traditions, so that every motivated practitioner could find everything necessary for practice — and it would be 100% correctly and beautifully done. 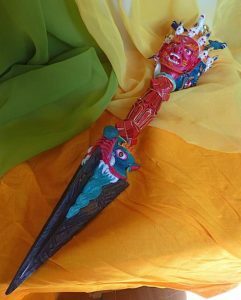 BW: Why do you feel it is important to carry on the lineage and traditions of traditional Tibetan ritual implement art? The important fact is that these objects are the support of practice. And, at the level of relative truth they are really important, because they allow us to move faster along the way. These things are part of the teachings of the secret mantra, its deep symbols. For example, when we get water, we need a vessel where it can be poured. Similarly, in order to preserve the meaning of the teachings of the Vajra chariot of the Secret Mantra, we need all these traditions, such as the tradition of ritual implement art, ritual traditions, traditional ritual melodies, architecture, and so on. Of course, all this is not a guarantee that the meaning will not be lost and we will have only an empty form without content and understanding. But on the other hand, I think that without these traditions as a support, progress is much slower. For this reason, I believe that keeping it is very important. Tradition is important in the creation of Dharma art and Vajra implements in particular. BW: Can you explain the significance of meteoric iron from a Tibetan Buddhist point of view? Is it considered somehow more sacred or special? This is due to the practices of angry deities. Meteorite is considered the most powerful material for creating objects such as purba, wrathful vajra or digug. Why? Well, actually this is secret information. I can only say that because the meteorite is the most destructive natural force that exists in this world. Remember one of the theories why the dinosaurs died out? Therefore, being a material that comes from the most destructive natural phenomenon, it certainly has a powerful potential for practicing the secret mantra. Therefore, according to tantra, meteoric iron is the highest material for creating angry objects. In our work we use the Seimchan meteorite. It fell about three million years ago and was very large, weighed a lot of tons. He was very destructive, and has a very beautiful internal structure. BW: I assume, based on your wonderful art, you are a Tibetan Buddhist practitioner? Who is your teacher? Oh sure. 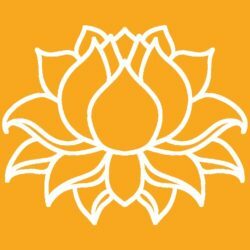 My root guru is Rigdzin Namka Gyatso Rinpoche. I have other teachers from whom I received the necessary knowledge and transfer in the field of dharma art. The first teacher who gave me specific instructions about this was Khenchen Palden Sherab Rinpoche and I always use his oral instructions. As for the Phurbas, here my main guru were Kyabje Namka Drime Rabjam Rinpoche  and Ganteng Tulku Rinpoche. In addition, the name for our workshop (Natsog Dorje) was given by Tsewang Dongyal Rinpoche. Namkha Rinpoche with a Phurba. 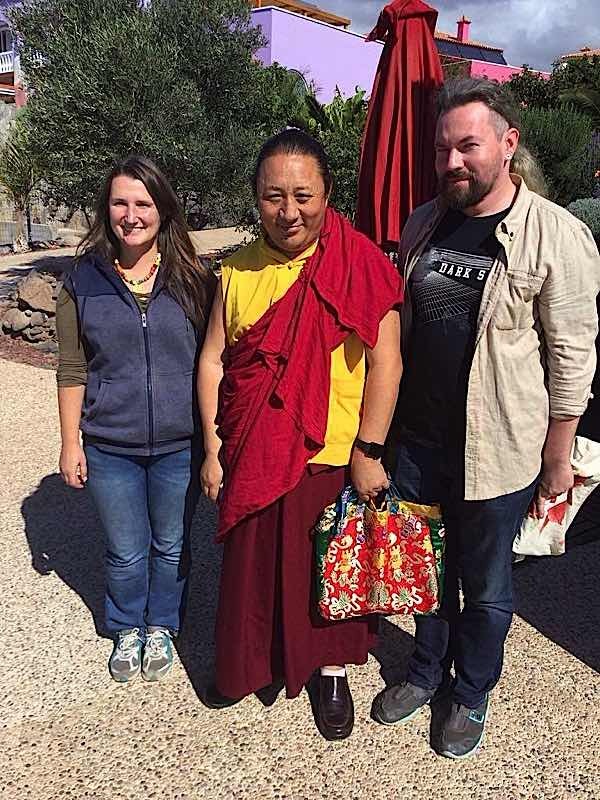 Namkha Rinpoche is Rigdzin Pema Tuthob’s root guru. BW: How long does it take to hand craft a new piece, such as one of your beautiful Phurbas or Vajras? It depends on many factors. From the complexity of the new thing, from how much time we can allocate to it, because we always have a lot of orders. So the time of manufacturing a new thing can be a month, and maybe a year for example. BW: Do you take on custom work? Yes, of course we do. But only within the framework of tradition. If this is someone’s distorted vision and some type of fantasy, then we will not do it. And not because we are such religious fanatics, but because we simply do not have time to deal with such things. Life goes very fast, as you know. BW: What teachers have you created vajra art for (that you know of). There are a lot of them. Of the widely known, for example Ganteng Tulku Rinpoche, Garchen Rinpoche, Rigdzin Namkha Gyatso Rinpoche, Tsewang Dongyal Rinpoche, Phagchok Rinpoche, Sogyal Rinpoche, Gochen Tulku Sang-Ngag Rinpoche, Orgyen Thobgyal Rinpoche, Jigme Tromge Rinpoche, also we are always given special support by Chagdud Khandro. I can continue, but it seems to me that this list is too long for the interview format. Because the creation of such objects have specific requirements. The main one is that the craft master should be a practitioner, and have four complete initiations of inner tantras; He must know exactly all the details of the object and their meaning. Otherwise, he will certainly make mistakes; During the creation, it is necessary to do practice, chant mantras, visualize and perform ritual actions. And it is obvious that all these conditions are difficult to observe. And it is impossible to do it at the factory. The process is quite long and complicated, although it does not include anything unusual in itself. When a new ritual object is to be created, the first requirement is to collect all the possible information. Read all available texts, view all the images, if necessary, then talk with knowledgeable teachers. When all information is collected, draw sketches and develop an action plan. 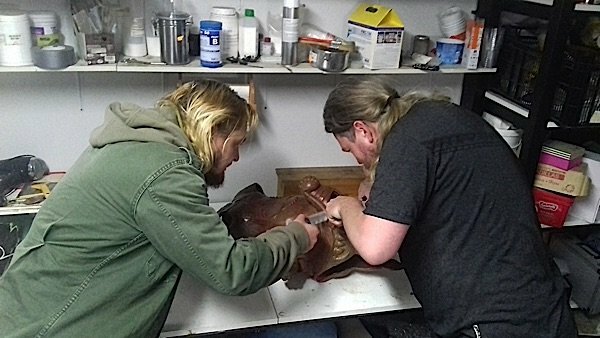 After that, a wax model is made, then a mold is made from it, then casting, then refinement in the metal. All this can take quite a long time and is not so easy. With root guru Namkha Rinpoche (centre). His Eminence Namkha Drimed Rabjam Rinpoche is the supreme head of the Ripa lineage of Nyingma Vajrayana Buddhism and a living Terton. The Ripa Lineage has its historical roots in the supreme head, Glorious Master Ripa Pema Deje Rolpa, the leader of both the family and dharma lineages of Rigon Tashi Choeling Monastery. Close up of the crafts people at Natsog Dorje hand-creating a wax mold for a traditional Vajirkilaya statue. These are truly unique and beautiful pieces, I would one day be honored to acquire such a special and sacredly sourced ritual item when the time is right.